Washington, D.C. – A new national opinion survey released today by the Consumer Federation of America (CFA) reveals that 71 percent of Americans “support the idea that the government should set and update energy efficiency standards for appliances.” In spite of this widespread support, the U.S. Department of Energy (DOE) is delaying improvement of appliance efficiency standards and at the same time working to weaken those currently in place. “Appliance efficiency standards have saved consumers hundreds of billions of dollars in lower utility bills over the past decade,” noted Mel Hall-Crawford, CFA’s Director of Energy Efficiency. “Today, a typical household saves approximately $500 per year on their utility bills as a result of efficiency standards,” she added. There is near-universal agreement (95% to 3%) that it is beneficial for appliances to become more energy efficient. Consumers said the three most important reasons to increase appliance efficiency are – lowering electric bills (72%), slowing the effects of global climate change by reducing nationwide electricity consumption (62%) and avoiding construction of new power plants which keeps electricity rates from rising (57%). When asked if they would support appliance efficiency improvements if they increased appliance prices, 74 percent said they would if the payback period was three years. Even though consumers are willing to pay more upfront for energy savings as appliance efficiency has increased, overall retail prices for major appliances, such as refrigerators, dishwashers, clothes washers and dryers, have actually declined in seven of the past ten years, according to one estimate based on an analysis of government data. For example: As a result of federal standards, refrigerators now consume just one-quarter of the energy compared to refrigerators in 1973. Yet, during this period, real prices of refrigerators declined by 50 percent even though these appliances grew larger and added features such as automatic defrosting and built-in ice-makers. See figure below. 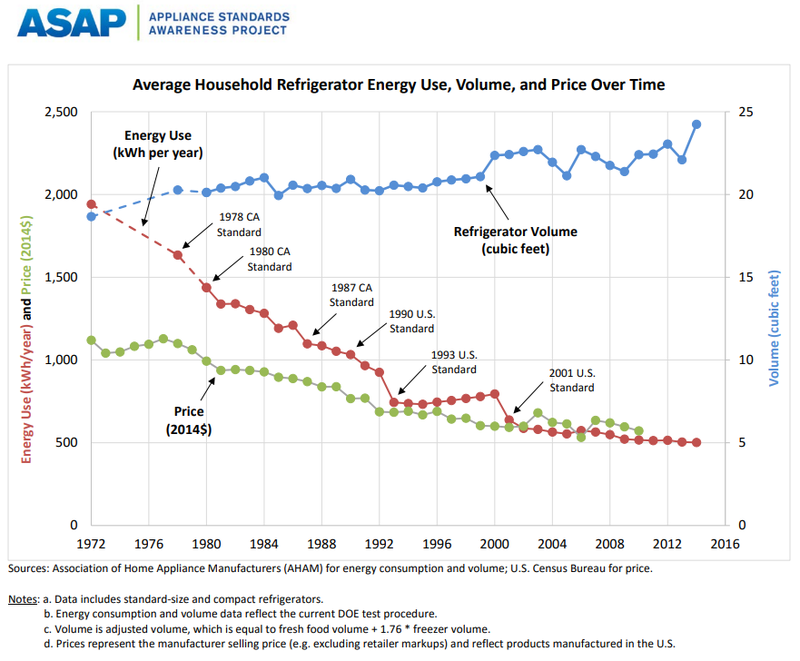 Despite greater appliance efficiency, lower appliance prices and strong public support, the Trump administration is working to undermine these sensible, cost-effective efficiency standards. The Department of Energy has repeatedly missed statutory deadlines to consider updating standards for household appliances such as: refrigerators and freezers, clothes washers, clothes dryers, and room air-conditioners, and is working on weakening standards for lighting products. “The blatant disregard by the Trump administration to act responsibly on appliance efficiency standards denies consumers the ability to lower their electric bills substantially,” said Jack Gillis, CFA’s Executive Director. Regardless, CFA encourages consumers to take action on their own to be more energy efficient and save money on their energy bills. For tips on steps you can take, go here. The survey data are available for inspection by the press. The survey was conducted for CFA by ORC International, which interviewed by landline or cell phone 1,003 representative Americans on March 8-11, 2018. The survey’s margin of error was plus or minus three percentage points.